Illinois hasn’t had a state budget for years. The state continues to spend money it doesn’t have, and the state’s credit ratings have dropped, increasing the cost of borrowing more money we don’t have to keep the rotten shebang going. Bills pile up; Moody’s Investor Service says taxpayers are on the hook for $251 billion in unfunded public union pension liabilities. Boss Mike Madigan, king of the Democrats who control things, wants tax increases but no real structural reform to bring stability to The Venezuela of the Midwest. And the whispers of bankruptcy won’t help the average (remaining) taxpaying chumbolones like you and me who don’t want to leave our homes but who’ll get stuck with the bills. Fortunately, Kass has a solution. Voting Democrats out of office and replacing them with fiscally responsible adults is not an option due to the massive gravity of Chicago, which pulls the entire state into moonbattery. So Kass proposes the next best thing: dissolve the state, dividing the territory between its neighbors. A grant of land as large as a case of the soda pop she taxes, so that she might stand on it and proclaim herself Queen of Taxwinkletopia. The sovereign of Madiganistan would presumably be Michael Madigan, speaker of the Illinois House of Representatives and longest-serving leader of any state legislature. He has been called the Real Governor of Illinois. 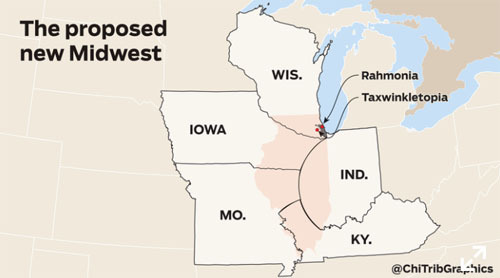 The Windy City moonbattery that is pulling a whole state into insolvency would be divided among three tiny nations where the damage might be easier to contain. Since they would be totally dysfunctional, the United Nations could make itself useful for once by stepping in to administrate them. Until a cure for moonbattery is discovered, it would be hard to imagine a better solution. On a tip from Bodhisattva. Cross-posted at Moonbattery.